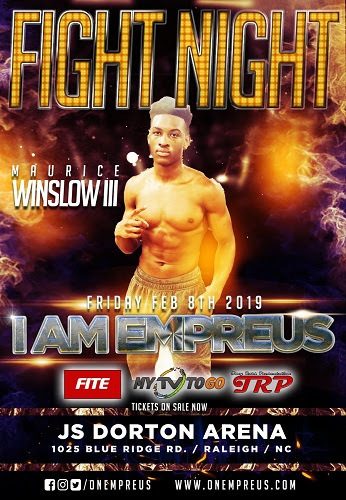 They say there is no place like home, and Maurice Winslow III is ready to find out when he returns to his birthplace of Raleigh, North Carolina to fight and earn his second professional win Friday, February 8th on the One Empreus signature boxing series card titled “I Am Empreus” at the J.S. Dorton Arena located on the NC State Fairgrounds. Winslow 1-0 (1 KO) made a successful pro debut in September of 2018. Winslow forced his veteran opponent of seven fights to quit on his stool in the second round of a scheduled four found fight. Winslow started with a bang and is now ready to give his fans, friends, and family plenty to cheer about in his homecoming fight. Winslow, who was raised in a family of boxers, began boxing at the early age of five. After fighting in over one hundred amateur bouts, winning four Golden Gloves and a national championship, Winslow is focused and confident he will become a champion. “When I come into the ring, I am focused on strategically taking my opponent out. I am ready to destroy. Outside the ring, I am totally different. I am focused and confident, but I am a humble gentleman who is extremely respectful.”…Maurice Winslow III. Winslow is a fighter by choice and is living a dream he chose. He does not feel any extra pressure fighting in front of his family for the first time February 8 at the J.S. Dorton Arena in Raleigh, North Carolina.